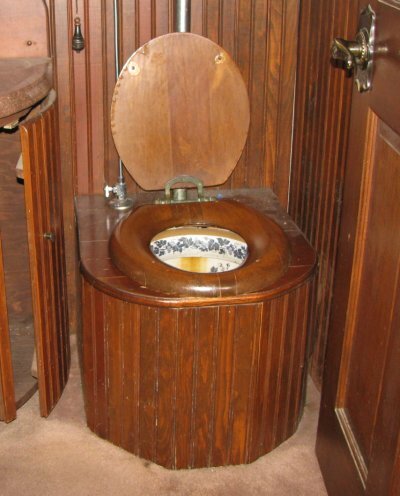 Here are some photos of a Victorian toilet I recently worked on. 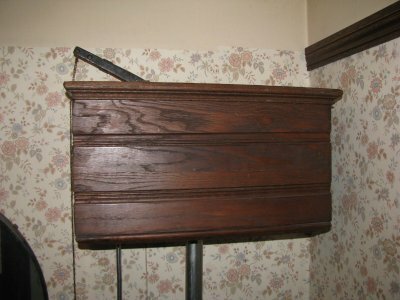 This antique water closet from the 19th century needed a lot of TLC. I was able to restore the vintage plumbing fixture back to full function. It's in a house on the historic registry in Oregon City, Oregon. In the photo above you see what looks like a typical copper-lined pull chain high-wall Victorian toilet tank. The two things to know about this tank are that it had a siphon flush valve, and that the center of the flush tube measurement from the wall is not the same as that of available replacement tanks. The bowl in this cabinet is an earthen-ware bowl with no integral p-trap, and a wash-down rim. The flush tube which is attached via a spud under the seat top was okay, as was the flush tube itself. I could replace the tank, but that would force me to work on the spud and flush tube, parts I didn't want to work on. Because I would have to adjust to the modern standard center of the flush valve if I changed the tank I would also have to change the flush tube. Besides... I'm a repairman, not an installer. These siphon valves and their gaskets seem to be unavailable, so I made some. 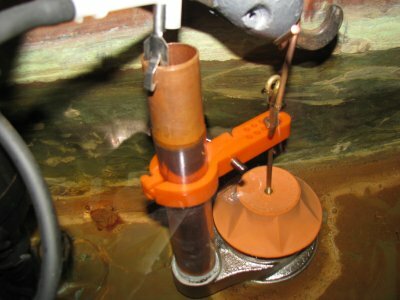 The siphon valve worked well, but the gasket and gasket seat not shown here were still leaky. 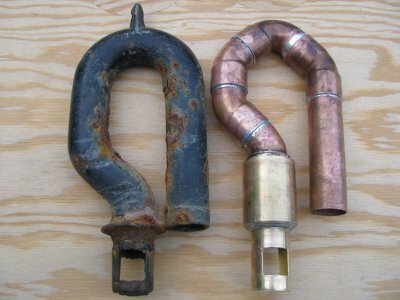 I found a company that was reworking “douglas valves”, normally for 2 inch flush tubes, into “douglas valves” for 1 ½ , or 1 ¼ inch flush tubes. By this means I was able to work with the center measurements I had, and bring this 19th century toilet and tank forward into the 20th century without changing its appearance. The Plumbing Geek is now spending an hour or more a day helping people by answering your questions via email or phone. Please consider the value of my help and help me as well with a donation in the amount of your choosing.